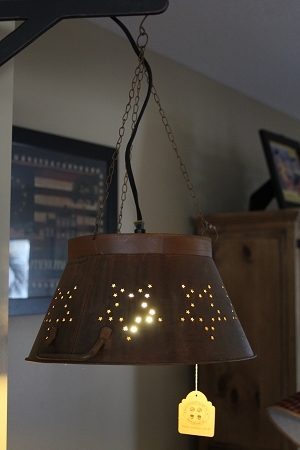 Colander Lamps are a great way to add country charm to your home, The Rusty metal colander has star cutouts with a hole in the bottom for adding the light. The three chained hanger and hook is ready for you to hang. Measures: 7" H (21" H including chain and hook) and 13-1/2" in diameter. Comes complete with a pendant adapter cord, black in color. 18 ft. long with an inline rocker on/off switch. Uses regular light bulb (not included - not to exceed 100 watts - indoor use only). Does not include the wall mount hanger as pictured. Works great on a simple hook.